Before fossil fuel-powered vessels came to dominate the seas, international trade was conducted on vast tall ships. Are they set for a comeback? Project represents a return to traditional maritime trading methods. 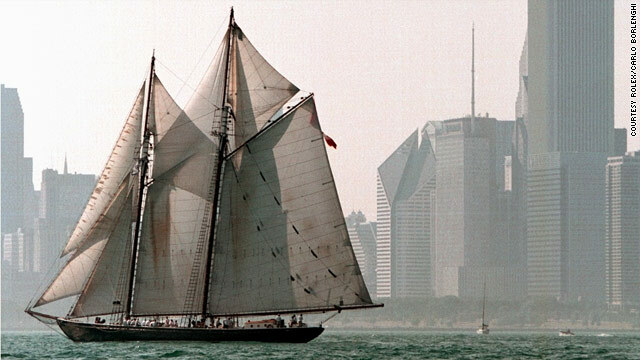 London (CNN) -- With its long hull, towering masts and expansive sails, it resembles a schooner from the 19th century. But fitted with a series of high-tech features, this so-called "sail ship" is designed to cut carbon emissions on the high seas today. Part of a fleet of carbon-neutral, wind-powered sail ships planned by Britain's B9 Energy, it's just one example of how companies are looking to the past for greener alternatives to the gas-guzzling vessels that transport the world's cargo. When it comes to wind power replacing fuel in shipping vessels, "it's not a question of if, but when," according to David Surplus, the chairman of B9 Energy, Britain's largest windfarm operator. "By most people's estimates, we have reached peak oil -- sooner or later the fuel will run out and there will simply be no alternative," said Surplus. Roughly 87% of international trade is carried out by the shipping industry, figures from the International Maritime Organization show. With the majority of world trade traveling by sea, the shipping industry is responsible for around 4% of global carbon emissions, according to the latest figures available from the United Nations. 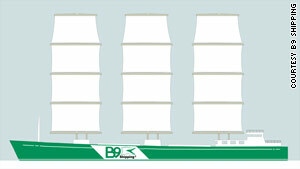 B9 expects its 100% carbon-neutral trading ship to be in production by 2012. B9 claims its vessel will be the first commercially produced merchant ship to harness alternative energy, but it certainly isn't alone in using old-fashioned sail boats to move goods. "At the moment it's happening on a fairly small, fairly local scale," said Jan Lundberg, founder of Sail Transport Network, a group that promotes sailing as a means of eco-friendly, cost-efficient trade. But the trend is growing, he said, pointing to examples like El Lago Coffee Company, which uses traditional sail boats to ship Guatemalan coffee beans to the United States, and the Sail Transport Company, a Seattle-based group that uses sailboats to deliver "petroleum-free organic produce." B9's new eco-friendly ships, planned to be in production by 2012, signify a return to a much more traditional form of merchant shipping. Before diesel-powered steel tankers came to dominate the seas, international trade was conducted on vast, wooden sail ships. The 100% carbon-neutral freighter will feature automated, self-adjusting sails that respond to minute changes in the wind to maximize propulsion. The boat will also take advantage of "skysail" technology -- a kite-styled towing system currently used on some cargo ships to improve fuel efficiency. Sooner or later the fuel will run out and there will simply be no alternative. In addition, a biofuel-powered engine will operate under less windy conditions. Surplus says that with these technologies, the B9 sail ship will be able to carry up to 9,000 tons of cargo. That's just a fraction of the more than 100,000 tons that much larger ships used for long-haul trade can carry, he admitted. But B9 will initially just operate within Europe, particularly in the North Sea and Baltic where the winds are strong. Surplus added: "There are currently about 1,500 similarly sized fossil fuel-powered ships working along these routes and our dream is to replace all of them." Whether sail ships can replace modern freighters on a large scale, however, remains to be seen. Jeremy Harrison, communications director at the British-based Chamber of Shipping, has his doubts. "I would love to see sail boats replace the current system," he said. "But I just can't see how it will be economical, even as fuel prices rise." According to Harrison, advances in fuel efficiency onboard super-large cargo ships will help offset the rising cost of fossil fuels. "Big shipping companies have already made huge savings just by 'slow steaming' -- reducing their speeds to save on fuel consumption," he said. Earlier this year Maersk, the world's largest container shipping firm with more than 600 ships, announced that it had adapted its giant marine diesel engines to travel at super-slow speeds -- reducing emissions by 30% and saving a reported $100 million in the process. "Unless you can build a sail-powered boat as big as the ships that are out there today, it will be very difficult to achieve the economies of scale to make it competitive," Harrison said. He said: "A lot of people don't understand what renewable energy has achieved onshore. If you simply transfer those economic models across to shipping, it completely transforms the economic proposition."